Our world lost a kind, generous, thoughtful and beloved man on March 8, 2018 when William Reid “Bill” Harshbarger passed away peacefully with his family by his side at the age of 76 due to complications from pneumonia. Bill was born on November 27, 1941 in Winamac, Indiana to Olive and Albert Harshbarger. As the son of school teachers, he worked hard and earned adoration and respect of those around him. Throughout his youth, Bill excelled in sports, particularly in basketball where he was a star player. In 1959, the Bainbridge High School basketball team on which he started had an undefeated regular season and captured the regional championship. Bill also participated in the Boy Scouts, earning the coveted rank of Eagle Scout. In addition, he also played the clarinet in the school band and performed in musicals on stage, most notably singing and dancing as Will Parker in Oklahoma! Finally, Bill was also a gifted and hard-working student who was the valedictorian for the class of 1959 at Bainbridge. It was during this time in high school that he met and fell in love with a smart and beautiful head cheerleader named Karen Vote who attended a rival high school, and on December 21, 1962, Bill and Karen married. Their marriage would prove to be a strong and enduring one, lasting over 56 years and producing three wonderful children. With the support of his loving wife, Bill devoted himself to his studies, and in 1963, he again was the valedictorian for his class and received a Bachelor’s Degree in Chemistry from Manchester College. In 1968, Bill earned his Ph. D. in Physical Chemistry and then he went on to do postgraduate research at Carnegie-Mellon University and Bell Labs. For the next thirty-five years, Dr. Harshbarger distinguished himself as a scientist, engineer, inventor, manager and executive. in 1971, he began his career at Bell Labs and became an expert in plasma etching, a key process in the making of computer microprocessors. Bill conducted and published research that would lead to important and far-reaching developments in semiconductor technology. He earned world-renown through his work, and in 1979, he was hired by Intel. His work there helped Intel grow into the world-leading manufacturer of semiconductor technology in the 1980s. His expert knowledge, work ethic and accomplishments made Bill a very desirable employee, and in 1986, Genus brought him to Silicon Valley to work as an engineer and executive. While at Genus, he spent four years working in Japan and traveling around Asia. In his final decade in the semiconductor industry, he was employed as an executive by Lam Research and by Applied Komatsu Technology, and he also taught classes as an adjunct professor at San Jose State University. By the time Dr. Harshbarger retired from the semiconductor industry, he was a highly regarded scientist who had published more than sixty technical papers and was a co-inventor for 29 US patents. Bill did not slow down after his retirement from Silicon Valley, and after Bill and Karen moved to Neahkahnie, Oregon in 2006, he devoted his energy to making the world a better place. Bill helped people with their taxes after he became an enrolled agent and consultant for H&R Block. He volunteered around town, helping out wherever he could. He was elected and served as a Board Member of the Neahkahnie Water District Board. He became a community organizer as part of the Emergency Volunteer Corps (EVC) of Nehalem Bay. 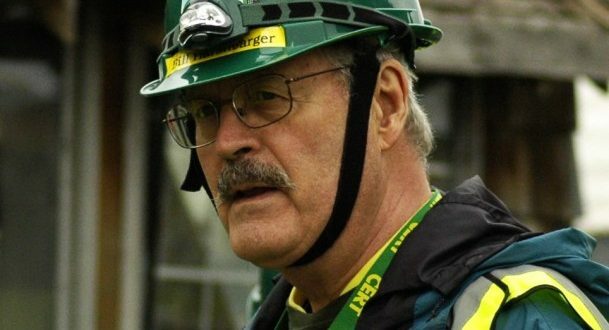 As a part of the EVC, Bill devoted himself to preparing his beloved north coast community for the Big One as a member and then the leader of the Nehalem Community Emergency Response Team (CERT). His tireless activity on behalf of CERT earned it statewide and national recognition and commendations for its disaster preparedness work. Through it all, Bill Harshbarger was a kind, caring and generous man as well as a devoted and loving husband, father, grandfather and uncle. He loved reading, listening to music and NPR, writing poetry and enjoying sports, good food and drink. He impressed everyone with his athleticism throughout his life and in his later years as he jogged along the beach and participated in local races. Bill always cheered those around him with his humor and kind words, impressed them with his poetry, and enriched their lives with his knowledge and wisdom. Bill was preceded in death by his father, Albert, and mother, Olive. He is survived by his wife, Karen, his older brother, Richard, his three children, Mikell, Amy, and Tom, and his three grandchildren, Marissa, Tilda, and Freya. A celebration of his life will be held in Nehalem at The Pizza Garden in late June. In lieu of flowers, Bill would want you to spend a little time, money, and energy to prepare yourself, your family and your neighborhood for impending natural disasters. He would ask you to find out about and become involved with the CERT in your area. Otherwise, donations in his name may be made to the Alzheimer’s Association, EVCNB.org or your local NPR station.